The i-doit application is an ITIL compliant platform for IT documentation which contains the know-how and experience of more than 15 years of consultancy and technology praxis in a high-profile project environment. In combination with SNAG-View and ((OTRS)) Community Edition this gives you a comprehensive, no-worries package which leaves (virtually) no wishes unfulfilled. i-doit is more than a database of maintained objects. Links between the existing objects ensure its character as a CMDB. This means that full details of an object are available very quickly at a central location. Since 2004, the company has focused on developing open source software and offers a corresponding portfolio of support and maintenance services. The i-doit application is an ITIL-based platform for IT documentation which contains the know-how and experience of more than 15 years of consultancy and technology praxis in a high-profile project environment. When installed, i-doit comes with some common object types and matching properties. This means that you can immediately start populating your CMDB. Of course, you can create your own object types and properties. With our "Extended Workflow" extension of the i-doit standard workflow module it is possible to document the success or failure of an assigned task. The standard merely documents "that something was done". Our extension ensures that it is also possible to see whether the task assigned to a specific object was successful or not. For example, for a task that instructs the admin to update certain servers regularly, it is possible to document that Server1 and Server2 have received the update, but Server3 has not, but the task itself has been performed. Of course, a short explanation can be given. The objects and their status appear in the overview of the completed task. The same applies to the "Workflow" category for each individual object. This data can be evaluated using the Report Manager. With the "Auto-Fill Name" extension, it is possible to predefine designations and, for example, to provide them with a counter. Depending on the object type, this ensures that both the name and the current counter of an object are managed correctly. It is therefore an ideal supplement to validation. Example: IP-telephone type objects follow the naming scheme "IP-Tel-XYZ". If the last telephone stored in i-doit is called "IP-Tel-023", the next created object will be called "IP-Tel-024" - the user does not have to remember the name of the newest object. In a standard configuration, i-doit offers a description field in each category. In many cases, however, it is sufficient to fill the description only in the category "General" if you want to describe the object more precisely. To increase the clarity, this add-on hides all other description fields. On the overview pages of the objects, the important information thus finds a little more space. With the help of Extended Search, object links can be created faster. i-doit offers a quick search for the object title in the link fields in addition to the path via the object browser. In the Extended Search configuration, you can define further attributes for the search. For example, the serial number from the "Model" category. The "My Objects" widget displays the objects on the dashboard where the logged in user is stored as a contact. This gives users very fast access to their objects. The CSV import is in many cases the first step when it comes to the initial filling of the CMDB. Unfortunately, the underlying Excel sheets often contain minor slip-ups. A Perl script developed by us is able to clean up one or the other uncleanness within the CSV. This ensures that objects are not unwantedly created more than once during the import or that attributes are filled in different spellings. For example, if the operating system is maintained in a list of servers in a column, it often happens that different spellings have become established over time ("Win 2008" and "Windows 2008"). In the CSV this does not cause any problems and everyone knows what is meant. For the import, however, these would be two different operating systems, so two objects would also be created. Both spellings would have to be taken into account in an evaluation. By small adjustments this script can be individually adapted, so that the quality of a CSV increases clearly. In addition, this script can process existing information in an i-doit-compliant manner. This is particularly interesting if (automatically) data is to be updated using the controller via the CSV importer and the underlying CSV was automatically exported from another tool. VMware is used as a virtualization solution in many environments. With the help of a script, the current data can be read from the vSphere database and the CDMB can be filled via the i-doit CSV import. This requires read access to the (PostgreSQL) database. Of course you can define which fields are to be read for the i-doit import. Thus, the current data of the virtual servers are also conveniently available in i-doit. With the help of the Report Manager, you can quickly and easily create your own evaluations in the i-doit interface. However, in some cases the report manager reaches its limits. For these cases, i-doit offers the SQL editor. However, this requires a good knowledge of the database structure. We use our many years of experience to create the required reports. 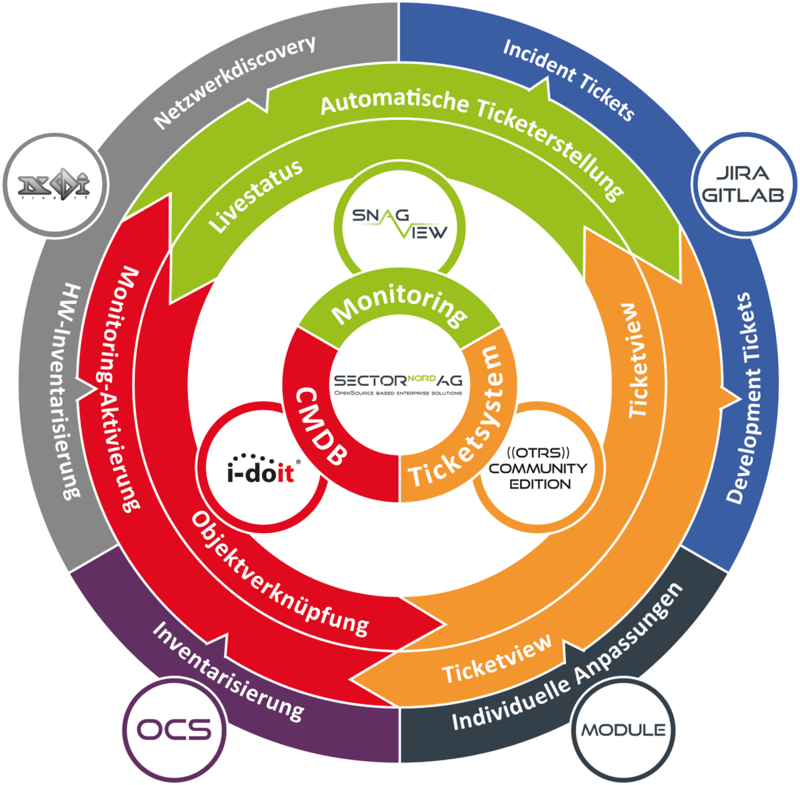 i-doit is part of the ITSM connector; as a central CMDB all data are provided for all systems here.